These guys are an incredible unit in the Gloomspite Gitz, pushing your chosen units to fight harder by supplying them with deadly fungi. With a few Sneaky Snufflers nearby, even a unit of mere grots can be transformed into a terrifying force on the battlefield. 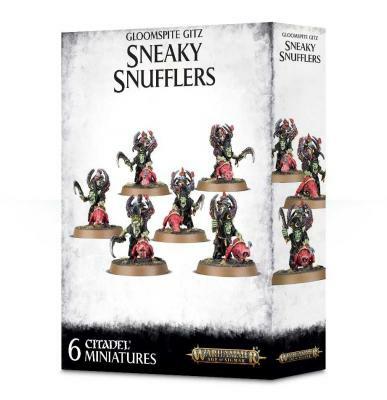 This kit lets you build and customise 6 Sneaky Snufflers, with their attendant snufflesquigs, and features a host of interchangeable heads for customising your models. This kit contains 30 components and is supplied with 6 x 32mm round bases.